Lori Calabrese Writes! : What's the buzz about this virtual book tour? I just wanted to remind everyone that I embark on my FIRST EVER virtual book tour tomorrow...talk about exciting! 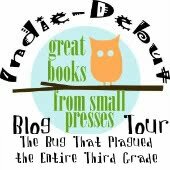 I invite you to visit my fellow Indie Debut members' blogs so you can check out their book reviews of my new picture book, The Bug That Plagued the Entire Third Grade, read interviews with the author (yep, that's me! ), guest posts, and enter some fun giveaways--what other than autographed copies of The Bug That Plagued the Entire Third Grade ! Guest Post: Want to know about Indie Debut? Congrats! Looks like a wonderful book. The trailer is wonderful! Thanks so much, Lori. Congrats to you on your novel and your children's book, What Are You Thinking? I just love the cover!